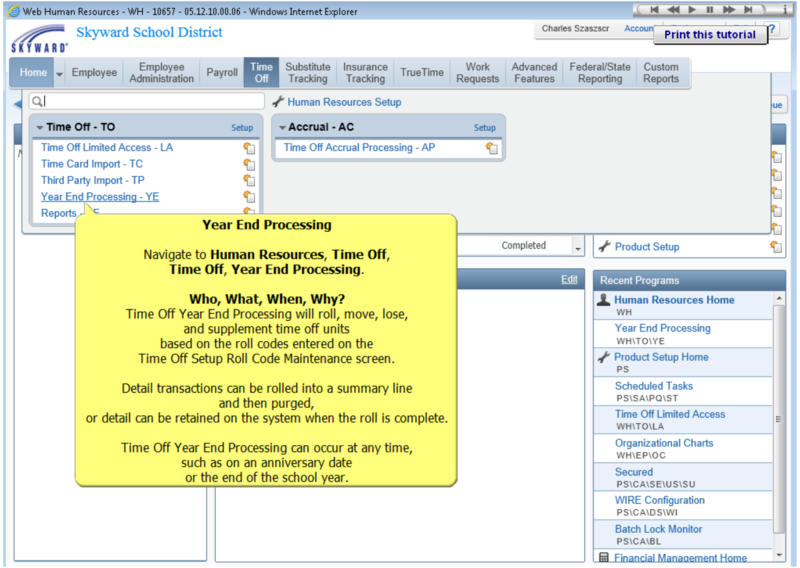 School Business Suite closeout items and tips are divided into two sections: finance and human resources. These sections are further split into three categories: what you can do in preparation for the year-end, year-end processes themselves, and what to do after the process is complete. Set up next year’s starting purchase order/ requisition number. Doing so will enable your team to create purchase orders and requisitions in the new fiscal year. To expedite this process, a utility can be used to mass establish these starting numbers. Ensure all purchase orders that should be rolled into the new year are in an open status. Be sure to update any batch status or reversal purchase orders as well as close out any POs that were fully received. Run the Encumbrance Carry Forward or Expense Open Purchase Order processes. The encumbrance carry forward process will roll any remaining encumbrances into the new fiscal year. The expense open PO process will charge any remaining encumbrances in the old year and roll the purchase order into a new year with (typically) a liability account. If you notice any negative encumbrances in the new fiscal year, run the Encumbrance Carry Forward process with the closure date set to the last day of the old fiscal year. A negative encumbrance could have occurred if a PO that was encumbered in a previous fiscal year got expensed in the new fiscal year. Ensure all accounts payable invoices are in an open status and update any batch status or reversal invoices. Complete check processing for any invoices that should be posted to the old fiscal year. Set up next year’s wire transfer and accounts payable ACH (automated clearing house) starting number. If you are using pending receiving, roll any outstanding invoices into the new fiscal year. Cancel any unfilled inventory requisitions or roll them over using the Inventory Year-End Requisition Roll process. 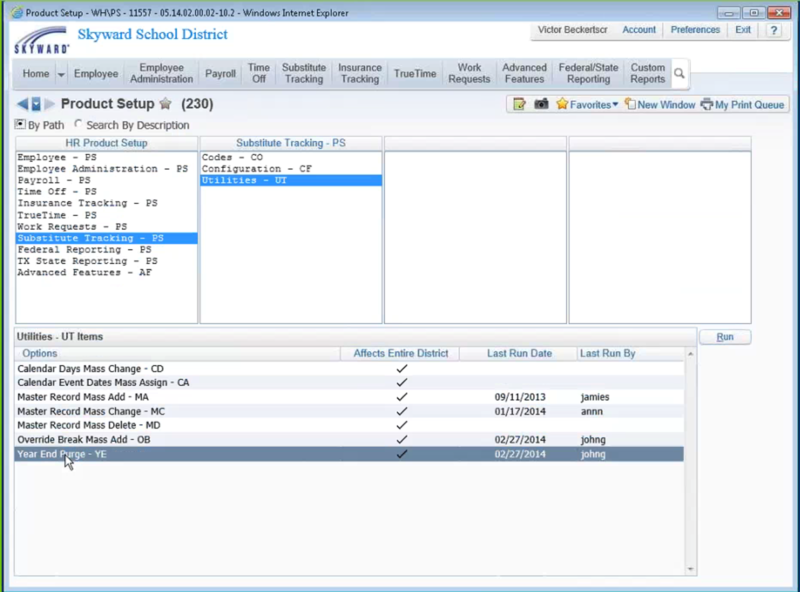 Tie asset values to the general ledger by batch updating any addition/disposal records. Add the depreciation schedule for the new fiscal year. Once it is added, you will be able to run Depreciation for the new fiscal year. Create next year’s starting batch numbers. These numbers will allow staff members to enter journal entries, cash receipts, and make accounts receivable entries during the upcoming fiscal year. 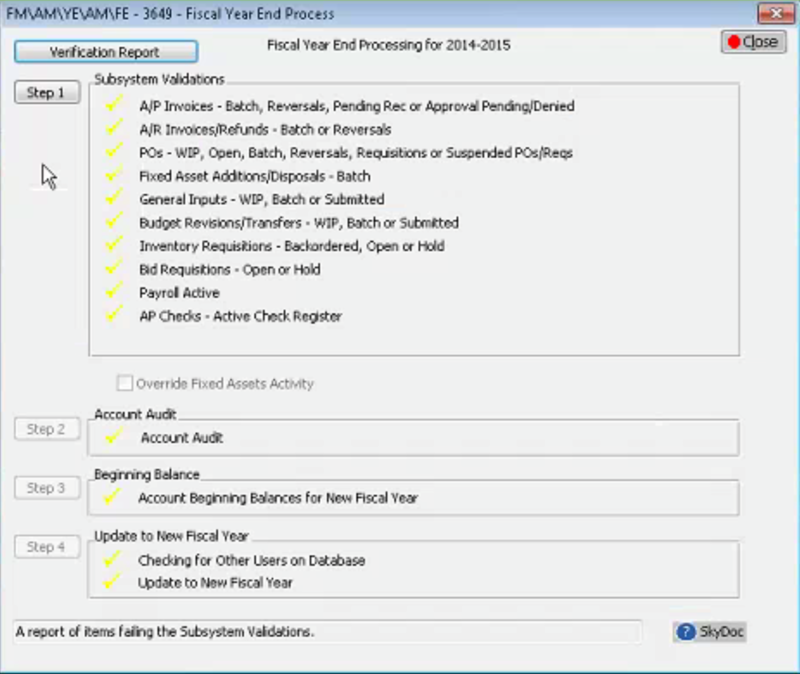 Run the Fiscal Year-End verification report. This report ensures there are no pending transactions that will prevent closing the previous fiscal year. Be sure your district audit has been performed. Then complete the Fiscal Year-End process, the final step to closing out the year. Districts have 6 months from the last day of the previous fiscal year to complete this process. Process the 1099M forms. Run the Vendor Payments report (available online) to identify any potential 1099M discrepancies. If you need to update the 1099 flag on multiple invoices, run the Mass Change 1099M Type on AP Invoice Detail process. This step may be necessary when a vendor does not set up 1099M information until the end of the year. Run the W2 audit to ensure all pay, deductions, and benefits were set up correctly. Complete the Fiscal Year-End process to capture benefits. You will not be able to run any payrolls two months after the start of the new fiscal year until this procedure is completed. Create calendars and matrices for the new year. Use the same calendar code from year to year (the calendar description, however, can be unique). Using the same code will be helpful when rolling calendars in employee management and substitute tracking. It will also allow employees to request time off in the next fiscal year. Add a unique identifier to any assignments that should not be rolled into the next fiscal year. For example, a job code called ‘temporary’ could be created and tagged to any assignments that should not be rolled into the new fiscal year. During the roll process, these temporary assignments can easily be excluded. Create a plan in the new year and roll assignments/ positions. Be sure to mass update the calendars as well as the matrices. Process the professional growth update for credits and degrees earned. Run the Step Increase process if necessary. Run the audit to ensure all calculations are up to date. Generate Payroll Comparison reports to review data before exporting it to the payroll system. Use Employee Letters to create salary notices or contract letters. These forms can be displayed within Employee Access for employees to verify electronically. Allocate time off for the new fiscal year. Allocation amounts are determined by the setup on an employee’s time off code. Run the Insurance Tracking Roll process if necessary. This process may or may not need to be run, depending on your district’s insurance year. Roll calendars and reset each substitute’s counter for the upcoming year. Update employees’ calendars attached to the Time Off tab in Profile. Updated calendars will allow employees to request date ranges of time off. Use either Mass Assign Profile Calendars (found under Time Off Date Range Entry Set Up within Employee Access) or the Calendar Codes Mass Change process (found within the time off utilities). Update calendars on timekeeping rule groups. Doing so will assign any paid holidays or non-working days in the new year to employees’ time sheets. We hope these steps and tricks will help you simplify your year-end processing. You can also check out SkyDoc for detailed documentation about each of these procedures. If you need further assistance, reach out to us. We are always just a phone call (or a click) away.